Many times, I would like to share my thought process on this blog, but I am aware that the way I think is not one that is shared by many. We are all trained to fit in with the prevailing cultural and social norms, and to use ‘politically correct’ words, behaviors, and beliefs. But as a spiritual student, I am often torn between the way I still misperceive the world, and the eternal, calming, loving, unifying nature of the Truth. So here is a description of my thought process, how I initially observe and judge situations and how I correct my thoughts and guide them to be more in alignment with Truth. From Zagreb, Croatia, we flew back to Colorado. It was the end of hunting season in the mountains of Colorado, and as always, I felt disheartened to be in the mountains at this time of the year. In order to keep the mountains clean, the county had placed large empty barrels by the side of the roads, to allow hunters to deposit the fur and animal parts that they do not intend to take home. The sight of these barrels made my stomach turn over. We only stayed for a short three days in our mountain home in Colorado, before we returned to Denver Airport and flew to New Zealand. At the airport, I saw a man wearing camouflage shorts, and on his bicep he had a huge tattoo of the National Rifle Association’s logo. There is a difference between holding the barbaric idea that liberty and freedom means that everyone has the right to carry deadly guns, and to actually tattoo it on his arm…. I had to remind myself that the world I was seeing was not loving and therefore not real. I was judging the Son Of God with unloving eyes, seeing his errors in a world of dreams. Whenever I see the ephemeral, I know that I am focusing on the world of appearances, and then I remind myself that everything I see is nothing but an illusion projected by my mind. I reminded myself that when I am finally able to forgive it all, all this will disappear…. At the airport, we sat in the United Airlines club lounge. In the seats across from us sat two men from New Jersey. They looked like out of shape retired businessmen. They talked on their phones with their friends or families, describing how much they enjoyed their hunting trip in Colorado. One of the men said, “It was fabulous! I loved everything about this trip. My only regret was that we were only allowed to shoot ONE elk each. I felt my heart clutch in anger and sadness. Does he knows that an elk gives birth to only one baby per year?…. Does he know that an elk carries the pregnancy for 240- 260 days, which is almost like a human being?…. Does he realize that it has a right to live its life in peace in the mountains, just like we all do?….. Behind their heads, I could see a shelf with magazines, and one of them had an article about the recent shooting massacre in Las Vegas, and the irony of the situation made me sad again. I found myself lamenting how foolish it is that the American people fight for their “right” to own guns and turn a blind eye to the fact that it leads to mass shootings and countless murders. Recently a toddler found a gun and shot three other toddlers in a private kindergarten. By the time I had finished writing this post, another shooting occurred in Texas, killing 26 people. When will they realize it is a barbaric law, and amend the constitution?…. I felt angry and frustrated and then hopeless. I quickly reminded myself that all of this spin of sad thoughts and emotions was generated by my ego, that is always trying to make this world of illusions appear REAL to me. My ego is heavily invested in constantly doing this, because my awakening from this dream signals the death of the ego. The ego is trying to stay in control of my thoughts, always trying to “fix” the world or point out all the injustices, the errors, the cruelty, everything that makes no sense and needs correcting. I simply need to wake up from the dream. “From the moment you appear to be born to the moment you appear to die, you will be confronted by an endless series of problems. These problems are designed to distract your attention to the illusory screen you are viewing, hopefully forever, and keep your attention away from the place where the answer to life lies: in the mind that projected the false universe in the first place, and then convinced you it was all true. It will take vigilance for you to change your mind, but that vigilance is the only thing that will lead you to happiness. There’s nothing in this world that will do it. Does that mean you can’t have the world? Ironically, you can have it. You just can’t believe in it. That’s how you give up the world, and you do have to give it up. It doesn’t matter that it’s an illusion. Back in New Zealand, we have a new government with a bright, idealistic and beautiful new prime minister. For years New Zealand has enjoyed a reputation of being a green and clean country, while everyone who lives here knows that some of our shores and rivers are so polluted by farm pesticide runoffs, that they are toxic to swim in. The new government is promising to correct all this. They are promising to plant new trees to replace those cut by the logging industry. On the sad side, they plan to impose heavy restrictions on foreigners buying houses in NZ, in an attempt to make housing more affordable for local kiwis. It is a practice that Australia has already imposed, and it has done nothing to stop the prices of houses in Sydney and Melbourne from doubling in a short time. But NZ is not Australia, which is a larger and much more self sufficient country. By not allowing foreigners to buy houses and apartments in NZ, they are cutting off a rich vein of money flowing into the country through real estate. It is short sighted and will not even stop prices of real estate in Auckland from rising, because most Chinese (whom this law is really trying to stop,) will simply form corporations in joint name with family members who are already NZ residents or citizens, and buy what they wish to buy anyway. On the other hand, they are promising to build 100,000 affordable houses over the next ten years, which WILL WORK to solve the problem, assuming they design them as fun, livable spaces and not create ugly matchbox ghettos like they did many years ago in New York City. Driving around the Far North, I felt overwhelmed by sadness. Some of the smaller towns, and even the bigger town of Kaikohe, felt like ghost towns with many empty stores and businesses that have closed down. Here was my ego again, feeling sad and hopeless, trying to make this world appear real to me again…. The path to enlightenment requires a moment by moment examination of my thoughts, in order to correct the ones that come from the ego, and replace them with thoughts of trust and Light. Back in our house, the green garden in front of the blue harbor, you wouldn’t know that the world even exists. It feels like true Paradise. The birds are singing, the wind chimes play music in the wind, the pheasants are beautiful and their babies grow up, the flowers bloom and spring has brought new buds and leaves to all the trees. The house was closed for five months, but you wouldn’t know it. It remained in great shape and it took us only one day to clean the inside. Taking care of the lush gardens took a little longer. I strapped on the weed-eater and Jules started the mower, and in a day and a half, we had cleared three months worth of grass growth, since our gardener had moved away. I was surprised and delighted to see how strong we are. We quickly fell under the magic spell of this place. Our days became quiet, almost dreamy and very lovely. We meditate, study, write sutras, cook, read, watch movies, talk, clean and eat delicious fresh food. We have sections of our garden that are neatly manicured, but it is the wild parts of the garden that capture my curiosity. We have an area where we throw grass clippings and broken branches. Vines and all sorts of climbers grow over the clippings, and even avocado trees, loquats and bamboo grow there as well. Logic says I should clear the vines and climbers, but I do not. Instead, I allow nature to do its thing and I go in there to explore and enjoy it. I gather edible flowers from this section of the garden, as well as wild herbs, watercress, wild mint, lemon verbena, wild basil, chive, honeysuckle flowers and more. In the evenings, I integrate them into our food. It tastes delicious and I feel happy to hear Jules say that he never eaten food that tastes so good…. Being home also gives us an opportunity to catch up on our planning. We are putting together our schedule for next year. After ski season in Colorado, we will return to NZ and then fly to Japan. We plan to stay in Japan for three months and walk two pilgrimages, the Kumano Kodo and the Nakasendo. In between walking pilgrimages, we will enroll in two Japanese language schools and enjoy living in two Japanese cities. 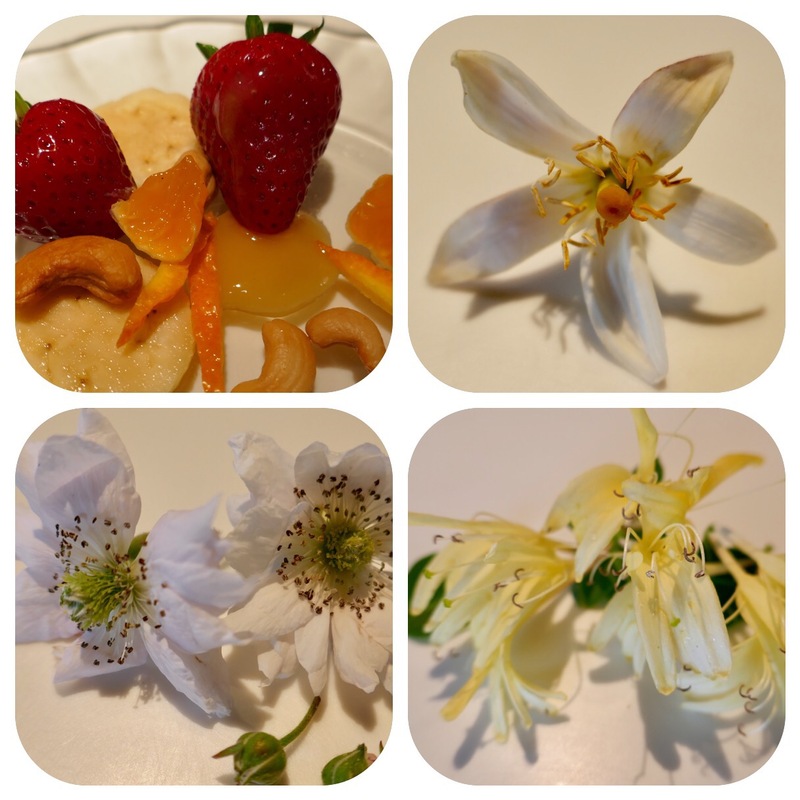 Before I say goodbye, I am adding photos of some edible flowers from our garden to this post. Meanwhile, stay tuned for our upcoming culinary “city break” to Hong Kong. I will try to share as much as I can from this “foodie” city…. Take good care and remember NOT to take this world of illusions too seriously. Remember to laugh as often as you can…. The Titanic-analogy is pretty striking! It is a phrase that Jules and I use often to remind ourselves not to focus on the ephemeral. Hello Tali, Mike Nixon (my partner) told me about you. Would you be up for giving me some advice about making investments? Thanks so much, Amy. Mike mentioned you a few times. It will be fun to get together sometime if you are ever in our area of NZ. Jules and I would love to meet you and be more than happy to share ideas. You can come over for lunch or dinner and a talk.